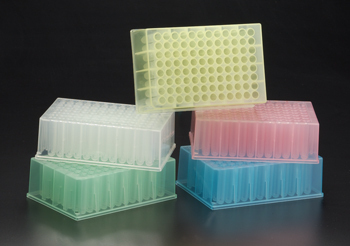 The 1.2 ml capacity round bottom deep well plate (1 ml when capped) is easy to empty completely and ideal for culturing bacterial cells. The polypropylene version can withstand centrifugation up to 6000g by using microtiter plate rotors. Polystyrene withstand 3000g.